Here's a short list of things that have recently puzzled me. 1. 64 oz. 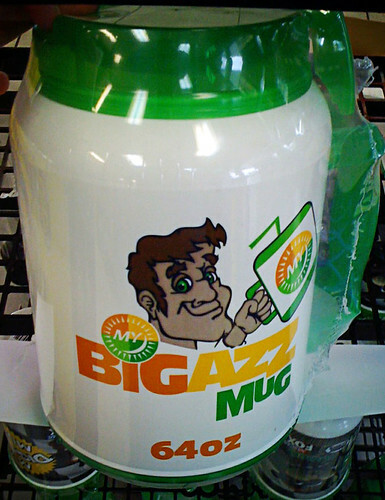 Mugs at Gas Stations. Where do you put this in your car? Is half a gallon of soda ever a good idea? Don't you begin to resemble the title of this cup if you drink from it? 2. Humidity. What global benefit comes with me having a "Whitney" lip 12 hours a day? 3. Mommy Blindness. There are moms who look at their less-than-cute children and think they are the most beautiful kids in the world. Then there are moms who look at those same children and enter them in modeling contests. No. 4. Chris Brown. BP needs to intervene to stop his crying. 5. People without Sunglasses. Squinting is annoying and makes me feel guilty and obligated to move so you're in the shadow. I hate guilt. You're also aging rapidly. Buy a pair. Let's be honest, you are only tall enough to block the sun for a squinting toddler and/or little person. C: That is not very sensitive of you. Not that you have that capability.